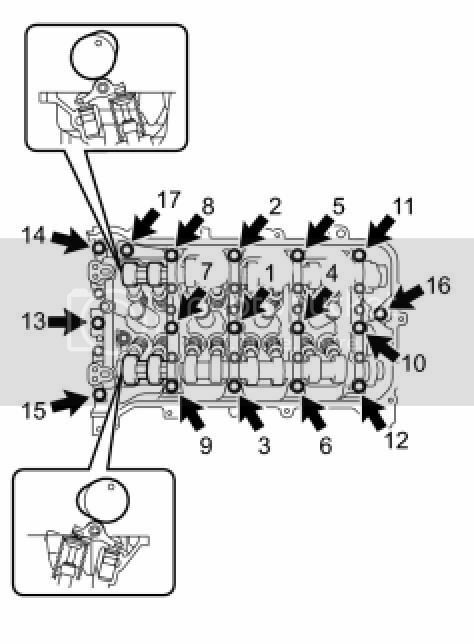 2 people I know have had issues with a rattle noise from the top of the engine which resulted in engine damage. It was confirmed to me that the camshaft bearing caps loosened. I am writing this up for info on how to torque your bearing caps if anyone is concerned about them and may be having a noise that is not related to the water pump and timing chain. It is a simple job that just requires a torque wrench and a new valve cover gasket. Found a video on YouTube from someone with a 2010 Corolla and how he put the rocker arms back on after they popped off from over revving. The torque specs for the cam shaft bearing caps are 12 ft-lbs. Must be torqued in the sequence shown. The torque specs for the camshaft housing sub-assembly is 20 ft-lbs. Must be torqued in the sequence shown. 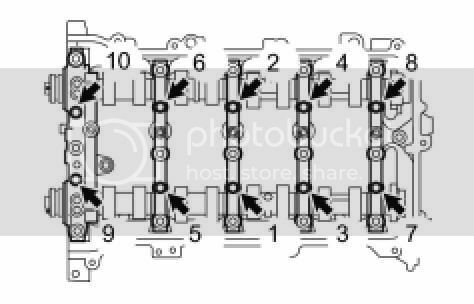 Valve cover torque is 7 ft-lbs or 84 in lbs. Last edited by TheJonas53; 01-01-2014 at 06:22 PM. Fixed. I dont know why the images got deleted. Updated first post with a video I found.